Plan your activity in advance by consulting with the relevant guide books and resources. Inform yourself about the area you are paddling, its length, duration, difficulty and any notable challenges, hazards or recent changes. It is not advisable to go out alone, it is much safer to go out in groups of 3 or more. Ensure where you are paddling is a suitable match for your own and your group’s experience, equipment and fitness. Carefully learn the limits of your abilities and stay within your limits. 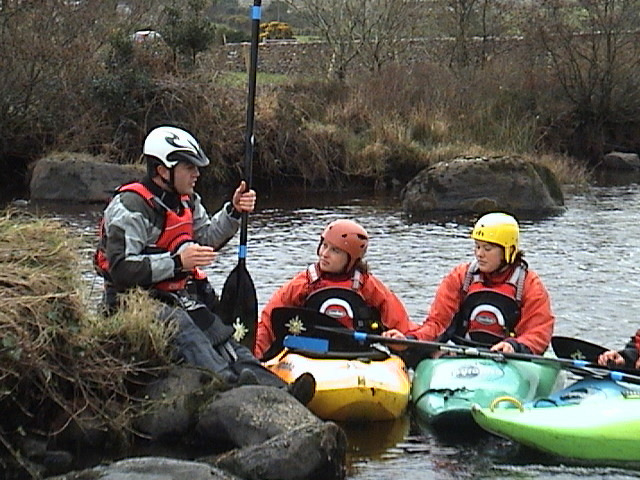 If you are new to the sport or an inexperienced participant it is recommended that you go out with a instructor or coach and seek formal certified training in paddling skills, safety, rescue and navigation which are essential for safe paddling in Ireland in groups of peers. Consult the weather forecast and the water levels in advance of your activity and only go out in favourable conditions. Be aware of the risks associated with wind speed, wind direction especially offshore winds, tides, tidal flows, temperature, rainfall and water levels and any moving water inland or Coastal. If you are inexperienced avoid windy days, spring tides and flooded rivers. A comprehensive weather forecast can be obtained at www.met.ie. Always wear an approved buoyancy aid and wear a helmet on any moving water, inland or coastal. Ensure your boat has sufficient buoyancy to stay afloat should it capsize. Wear adequate clothing and be aware that prolonged immersion in cold water can lead to hypothermia. Think ahead of how you will deal with any emergencies that might occur and bring any safety equipment you might need e.g. throw lines, tow lines, food, drink, spare clothes, first aid kit, pin kits, flares, split paddles, repair kit, form of shelter and a form of communication. Ensure you and everyone in your group can swim to the bank or shore in the event of a capsize. You must have the skills to right a capsized boat, empty any water if necessary and get yourself or a friend back into the boat in deep water. It is advisable to leave details of your activity with a responsible adult on the bank and to carry a mobile phone or VHF radio in a waterproof case. In the unlikely event of an emergency dial 999 or 112 to contact emergency services. Use VHF Channel 16 to contact the coast guard. You are required by Irish law to wear a 50 Newton CE/ISO certified buoyancy aid while Canoeing. Make sure your buoyancy aid is in good condition and the correct fit. You should wear a helmet when Canoeing in moving water, inland or coastal. Ensure your helmet is CE or ISO approved for Canoeing and that it fits correctly and protects the temples and back of your head. Be proficient in rescue techniques appropriate for the activity being undertaken and practice these techniques regularly. Learn to recognize hazards on the water. You can improve your safety on the water by attending an accredited safety and rescue training course. Assist anyone you see who is getting into or already in trouble. Be aware that conditions change and new hazards can occur between trips. Be continually aware of the hazards associated with the environment in which you are paddling. Think carefully about the suitability of your kayak / canoe for the particular conditions you are paddling. Know the design strengths and limitations of your kayak / canoe. Riverestuaries can look placid but may be subject to strong rip currents extending considerable distance out to sea. Local knowledge should be sought and caution exercised against hazards caused by rapid “drying out” of mud flats which may cause difficulties. White Water Rivers are generally graded at medium levels. By their very nature, such grading systems are subjective and may change suddenly with fluctuating river levels. ICU Safe Paddling – Although this document is a good resource, it is not the most up to date with regards safe practice and ethos.